A written financial plan is your key to success with money. Successful people know that it is when you develop a money plan that is individually and specifically designed around your own goals that financial planning becomes effective. This Success With Money guide, Your Financial Plan of Action , will lead you through the steps you need to take to develop a money plan that will work for you, personally. Read through this article, carefully. It will tell you what you need to know about the content on the site, but more important, it will tell you how you can use it to your greatest advantage. Keep in mind the action steps you need to take for your own financial success. The Financial Laws section of this web site includes clear explanations of each of the ten essential laws that determine our financial success. They are comprehensive in nature, covering all the basics. Reading these articles will give you a strong foundation for working out your personal money plan for financial success. I will not tell you to read them first (the articles in the Laws of Money section are comprehensive—that means a little longer than others), but over time you do want to study carefully the basic laws of money; no one can succeed with money if they do not understand money and how it works in the real world. All of the practical steps you find here have their roots in these laws. You can follow these steps without understanding them completely, but the better you understand the reason behind them the better you will be able to apply the principles to your personal needs. Study carefully the basic laws of money; no one can succeed with money if they do not understand money and how it works in the real world. In addition, as you gain an insight into the way money really works and begin to get the overall picture, you will soon realize that this is something you can master. It is within the scope of any individual who applies themselves to the task. Determine to be patient but determined. No one can absorb all they need to know immediately. Plan to read these articles once for a good overview and then review them over time as you work to apply them to your life through your personal financial planning process. Choose to make your financial success a journey, an exciting and profitable lifelong journey. The most important step in any achievement is the initial one of setting a goal. Nothing happens without a specific goal being set. Even then, nothing happens without a plan to reach the goal. Goals and plans are absolutely essential. Putting your goals and plans in writing is by far the most powerful way to set them in motion. Get some paper and something to write with. A three ring notebook is one good idea. I've go to where I really prefer to write on my computer, but there is still some value to putting things down on paper. Start writing down your general ideas to start, brainstorming if you will. Even before you set your first goal, write down important ideas ideas about things you want to achieve financially. The planning process is simple: organize your thoughts into groups of related interests, then form specific goals, and finally write out your financial plans for reaching them. Obviously you cannot do everything at once. An important part of this process will be determining the right priorities for your life in view of your own personal circumstances. The most important thing you can ever learn, financially speaking, is how to get in control of your money. I am convinced that the number one reason for financial failure is a lack of control. People just don’t know how to get in control of their money and there are very few resources to help them learn. The most important thing you can ever learn, financially speaking, is how to get in control of your money. Most people watch as increased income or income freed up by paying off debts just seem to evaporate into thin air. They have no clue where it goes, it just goes. Once you learn how to take control of your money this will no longer happen to you. You will have the money to help you reach your important financial goals. To learn the skills needed to control your money, be sure to study and apply the techniques found in the five articles under the section called, Take Control. These skills, are not difficult but most of them are generally unknown. Learning the skills you need to take control of your money is the first thing you want to master and the foundation for every other financial achievement. After you get in control of your money your next step should be to get out of all personal debt. The section called Get Out of Debt explains in detail all you need to know to be successful in eliminating personal debt. Unfortunately, living in debt has become so common that for many it is seen as the norm. But normal is not the same as good. Believe me, the peace of mind and sense of freedom that come from being out of debt is terrific. Getting out of debt is not easy and it takes time—for me and most others who have achieved it, it took several years. But it is more than worth every effort it takes. So make getting out of debt a clear focus of your financial plan. If you are reading this you have probably come to realize that debt is one of the most limiting factors in the daily lives of most Americans and with many others around the world. Resolve to eliminate it from your life as soon as possible. However, don’t work on eliminating debt to the exclusion of everything else. It can be discouraging for anyone, especially if they have a lot of debt, to feel like that is the only thing they are achieving. The articles on debt elimination will deal with this issue further. Many projects that get off to a good start falter along the way. Don’t let that happen to your financial progress. One of the best ways to assure that it doesn’t is to set up a regularly scheduled time each month to take stock and plan for the future. The second guide in this section, Guide to Monthly Planning, sets out the essentials for establishing an effective planning program. As you read through that guide, take some notes. Make yourself a separate “To Do List” just for your money plans, a simple written list of the basic things you want to do each month to review your progress and plan for the upcoming weeks. Make yourself a separate “To Do List” just for your money plans, a simple written list of the basic things you want to do each month. The importance of this step in your money plan is probably obvious, but it is easy to neglect. Be sure to use this technique from the beginning. It will help you to keep up with your progress and keep you on track toward your goals. Use the Success with Money Action Newsletter to full advantage. If possible, read it just before your monthly planning time to stimulate your thinking and provide motivation for your work. 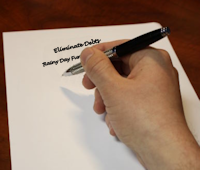 The newsletter deals with each of the essential money laws over the course of each year with suggested action steps for each month. Tied into the monthly planning sessions it can help you better develop your personal financial plan and achieve your goals. A sign up form is found in the right hand navigation on most pages of this site. If you haven’t registered for it yet, sign up now. 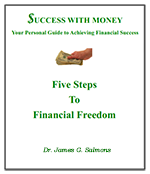 It is free to use and can provide a lot of help as you move toward success with money. For most people, believe it or not, increasing income accomplishes little good. Why? Because they never learn to control their money in the first place. As a result they may even double their income and see little improvement in their daily lives. The money just evaporates into the myriad of daily opportunities to spend money. So be sure you begin by getting in control of your money first. But then, along with reducing expenses and paying off debts, it is important to work on increasing your income. With the right knowledge and a little effort most people can greatly increase their income. Read the guide article, Increase Your Income , to get started on your plan to attract more money into your life. With the right knowledge and a little effort most people can greatly increase their income. Read my section of articles under the title Increase Your Income carefully and think about the possibilities for you to succeed in increasing your own income. You may be surprised at your undeveloped potential. Be sure to include increasing income in your money plan! There are two distinct forms of income you want to understand clearly. First, active income that you earn with work and second, passive income which is income you receive through investments, rent, royalties, or some other payoff not reflecting work. Passive income is the basis for “retirement” or true financial freedom at any age. Most people neglect passive income and some never think of it at all. Do not wait until you have eliminated all debt or reached all other financial goals to start saving and investing. From the very beginning it is important to save some money and usually a good plan to do some investing. Include both in your money plan. The recent financial crisis around the world has caused people to understand, often for the first time, the value of an emergency savings fund, money which is relatively easy to access (for example in a bank money market savings account). In addition, a financial freedom fund (or retirement fund) is something to at least consider from the beginning of your planning for financial success. These and other forms of saving and investing are discussed in my series of articles, Increase Savings and Investment. Many people focus on debt reduction even to the exclusion of these two areas. Everyone needs to use their own judgment on this, but I recommend some savings and investments from the beginning. Progress in this area is also motivational. Once personal debt, at least credit card and any other consumer debt, are eliminated these need to be fully funded. As you discover the peace that comes from having a fully funded emergency fund and begin to see your savings and investments growing, you will begin to enjoy working with your money a lot more. Get started immediately with personal financial planning by working on your written plan. Writing out your financial plan is a key element in any success strategy. Following this guide you will soon be amazed at your progress. Every achievement builds on the previous one. It can all be exciting and even fun. Cover all the bases. Work on your money plan until you reach all your income and savings goals. Be certain to plan ultimately for enough passive income to make financial freedom a reality in your life.